Entryway Remodel Las Vegas: Where Can I Install Stained Glass in My Home? Welcome to the Entry Brite blog! On our blog, we discuss ways to create a entryway remodel that you will love and the ways a stained glass front door and other stained glass elements can benefit you. Stained glass can assist to create the perfect vintage look to match the aesthetic of your older home. However, it can also add a beautiful look to your modern or contemporary home in Las Vegas. The design options are endless and can up the curb appeal of your home. If you love stained glass and understand all the benefits that it can provide, there are a few places that you can implement it in your home. A stained glass front door can be the perfect centerpiece to your home. It allows your door, which is a natural focal point of your home’s exterior, to look its absolute best. You can have a stain glass element created to enhance your existing door or you can replace your current door with one of stained glass. Not only is a stained glass front door beautiful, but it also allows more natural light in your home while maintaining your privacy. You can create a beautiful centerpiece to your home by upgrading your front door using stained glass. However, if you really want to make a statement, add stained glass to your entire entryway. Incorporating stained glass into your entryway is an effective way to make a statement, add greater curb appeal to your home, and allow additional natural light in your home. Like a stained glass front door, creating a stained glass entryway allows you to enjoy more privacy while still allowing some visibility. When designing stained glass for your entryway you can employ any number of styles. You can even use wrought iron! The options are endless — transform your space with glass! There is no better place to install stained glass than your bathroom window. Not only can stained glass ensure your privacy, but it can allow you to still enjoy a considerable amount of natural light. Though it can be nice to look out the window when taking care of business or getting ready for your day, more often than not a window in the bathroom is a nuisance. Stained glass can take the hassle out of maintaining privacy and can create a relaxing ambiance. Also, placing stained glass in other parts of the house — such as the bathroom — can allow you to tie in your front entryway stained glass with the rest of the house. Stained glass doesn’t just have to be on the exterior of your home. Include it inside as well! Placing colored glass within your cabinets and pantry door can tie in the design of a stain glass front door and add color and style to your kitchen. Choose the same colors as the stained glass in the rest of the house or use those colors as accents for colors that better match the aesthetic of your kitchen. To dress up your patio doors and enjoy beautiful colored glass when you install stained glass in your patio doors. What we hear from many of our clients is how much they love their stained glass and so why not install it in a place that you will see it all the time? Stained glass patio doors allow you privacy and natural light and can add value to your Las Vegas home. By installing stained glass throughout your home, you can create a cohesive theme that can transform your space into a colorful, elegant or modern, naturally lit space. Are You Ready for an Entryway Remodel? 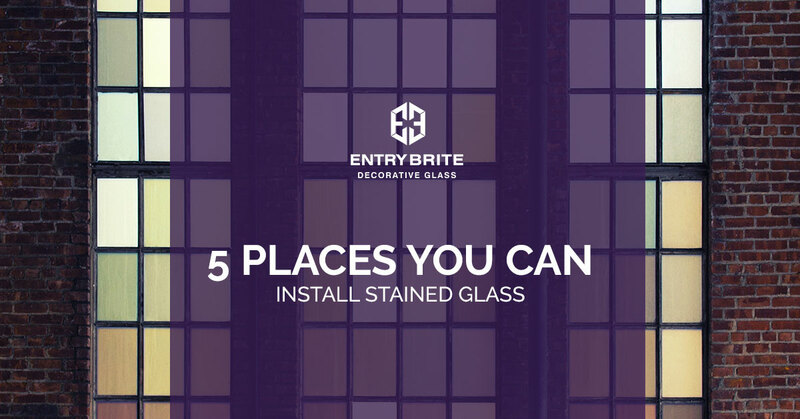 Entry Brite specializes in creating customized entryways with stained glass. However, we can offer our design and installation services for installing stained glass anywhere in your home. Our Top Rated Local® decorative glass experts have helped homeowners in the Las Vegas area create unique, beautiful spaces for years. To learn more about what we can do, view our gallery, before and after pictures, and watch a video that shows us at work, visit our website. We know how to use glass to compliment your style and your home’s architecture. Contact Entry Brite!